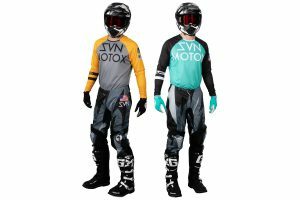 If you’ve been riding motorcycles for a while you will no doubt either of had a knee injury or know someone with a knee injury. 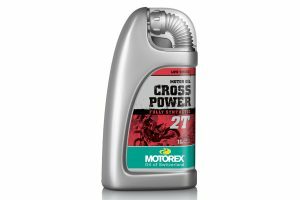 The knee is one of the largest and most complex joints in the body, and with motocross and enduro riding being very taxing on the body and naturally dangerous, the knee is one area that is easy to do significant damage to which means long periods of time off the bike. There are three main approaches to knee protection: 1. Don’t worry about it. 2. Knee pads, 3. Knee braces. Knee pads are the entry level of knee protection, all they are is a little bit of cushioning for an impact and don’t provide any protection for hyper extension of the knee or protection of side to side movement. Knee braces are designed to protect a whole range of knee injuries, including ACL and MCL damage as well as impact protection. 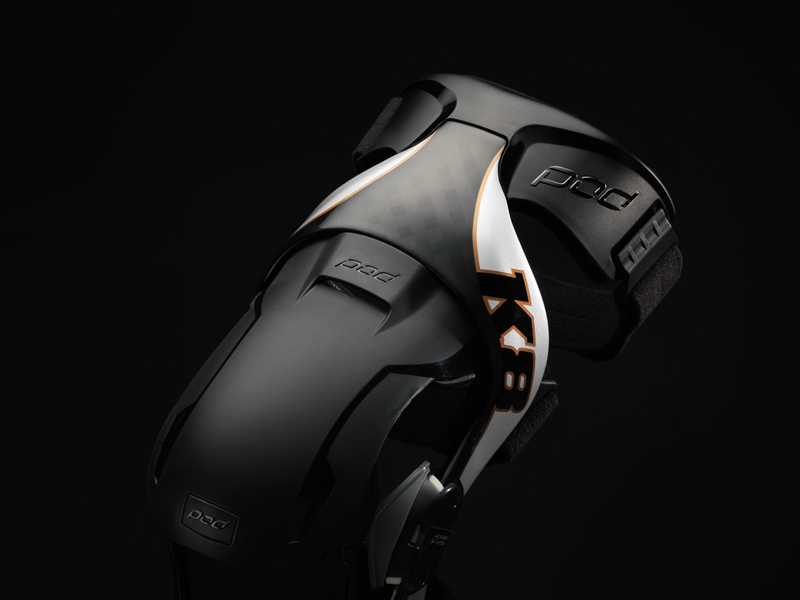 Pod Active has been around for the last 10 years, and the latest edition of the Pod Active Knee brace is the K8, which has been completely overhauled for 2018, boasting new technology and new materials along with feedback from racers and customers. The K8 is the top of the range offering from Pod Active. The K8 knee brace is designed to be an extension of your body and to be as lightweight and slim fitting. 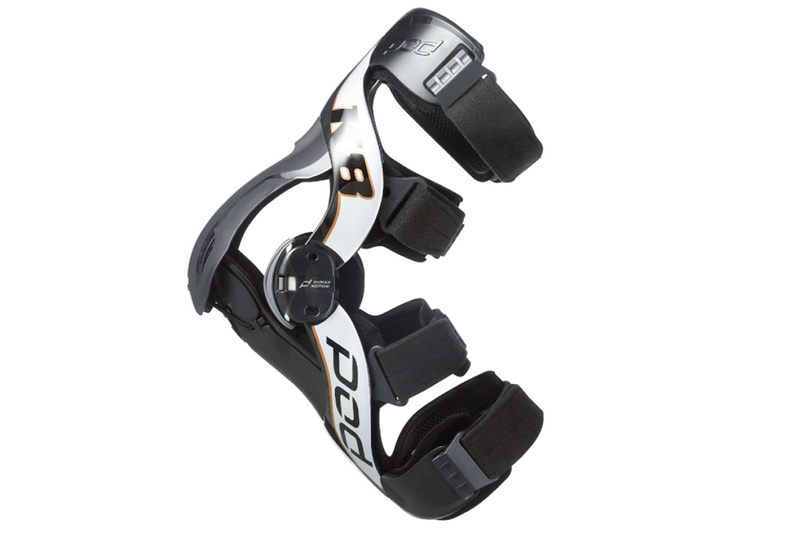 The brace is made up of a carbon frame, patented hinge system, antimicrobial frame liners, adaptive cuffs with velcro straps and removable impact guards. That makes it sound pretty simple and doesn’t give due credit to the research and technology that goes into the K8. The frame is a forged carbon construction, the construction process was developed in Formula One and allows the frame of the knee brace to be much slimmer and lighter than the traditional ways of constructing a carbon knee brace. The biggest advantage of the Pod Active K8 brace is the hinge system. The hinge uses shock absorbing ligaments – the ligaments have been tested to 100,000 cycles without failure and are so strong they can hold the weight of a KTM 1090 Adventure bike. The ligament is made from vectron fibres which is five times stronger than steel. 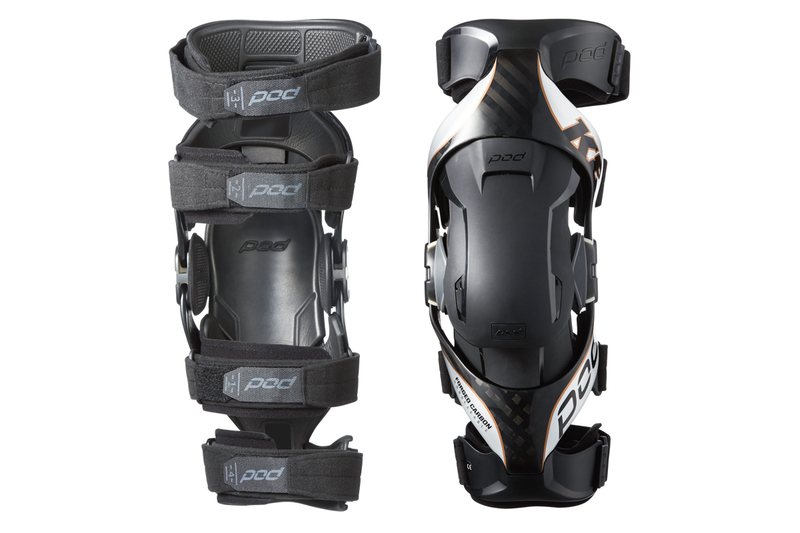 The ligament design allows Pod Active to shift away from using the traditional mechanical design of most knee braces. The ligament is housed in a patented hinge housing system which controls the range of motion – the inside of the hinge system is the contact point with your knee which uses antimicrobial liner for comfort and support. Shims are also available to make the fit of the knee brace custom fit for your knee. Adaptive cuffs allow for muscle movement and also disperses load from the previous solid cuff which also prevents injury and breaking of the brace. The strapping system is a four-velcro strap configuration to keep the brace in place. The antimicrobial liner has been adapted to the brace which contributes to it being multi-sport friendly and preventing the knee braces from absorbing sweat and moister causing bad odours and generally helping to keep the braces clean. After a few rides using the new K8 Knee brace, I’m impressed with how well the brace fits and feels compared to my previous set of knee braces. The brace feels really comfortable and remain put on my legs even after a full day on the bike. Like most people, my knees are not exactly the same dimension and fitting the different size shims to get the exact fit for each knee was easy to do. As mentioned, fitting the braces to the leg is via a velcro strap system. The new K8’s now have four straps using quick-fit clips, these make fitting the braces a little quicker. The frame of the brace is really slim compared to the other braces I have used, and its light and comfortable as well. Overall the function of the Pod Active K8 brace is amazing. After riding with a set of lnee braces it feels strange riding without them or even with knee pads. If you are serious about your riding or spend significant amount of time on the bike, then you should really consider getting your self a set of braces to prevent long term knee problems and injury. Distributed in Australia by Monza Imports, the new K8 knee brace is available now at RRP $1139.95 for the pair or RRP $569.96 each individually. For more information, visit www.podactive.com.